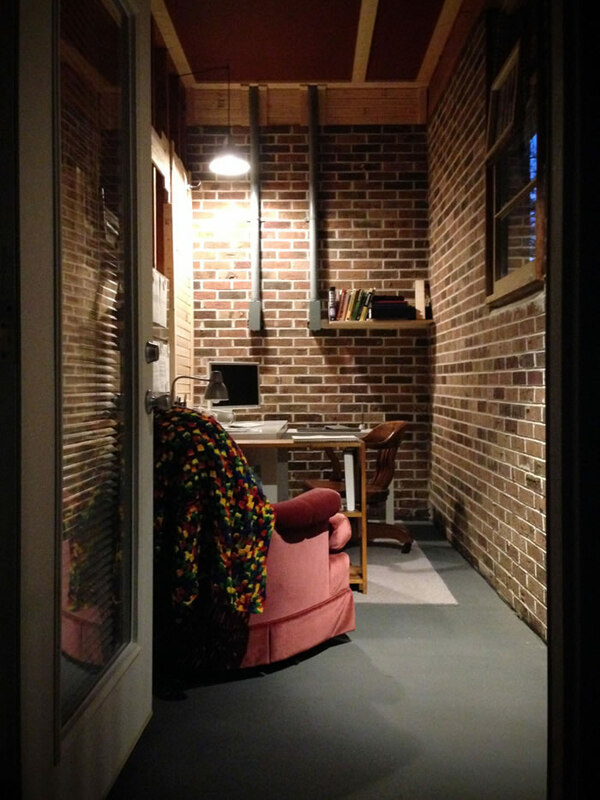 In the fall of 2014, faced with the longest, most difficult portion of a major revision for my not-yet agent, I decided to commit wholeheartedly to an endeavor I had only thus far daydreamed about: I would make myself a writer's space, separate from our house. Partly, yes, this seemed like simple procrastination -- avoiding the monumental challenge of a task that would largely define the beginnings of any future I hoped to have as a writer. No small thing, this revision. So, I told myself that it was also a very practical course of action: our eighteen-year-old cat, Harry Potter, had lately been howling at odd times of the day and night, making working out of the house near impossible (and my wife and I live in a small house in a small town, the nearest coffee shop a forty-five minute commute). If I were to make any progress on my manuscript, I told myself, I would just have to have such a space, no doubt about it, no way around it. Yep. I did a little research into writers' huts and shacks -- famous retreats of the mind. Virginia Woolf had one, more a lodge of her own than a room: a converted toolshed with a brick patio and big glass windows that looked out upon the lawn. She wrote there in the summers and, once heating was supplied, winters, too. George Bernard Shaw had one, a little shack built on a turntable so it could rotate and take advantage of the moving sun. Americans had their writing huts, too. Mark Twain. Dylan Thomas. A New England writer named Michael Polland actually built his own, after the fashion of Thoreau, and wrote a book about it. I read his book, A Place of My Own: The Architecture of Daydreams, and decided, knowing nothing of ground-thaws and shifting foundations, that it would probably be best to simply buy my room and have someone else install it. At that point, Crystal and I -- she, my life-partner and soul mate, ever-so-supportive of the architecture of my own daydreams -- began looking at pre-fab sheds. We also looked into renovating our own backyard storage shed, which would have required any number of structural repairs, along with new wiring, insulation, air conditioning, sheetrock, flooring, heating, and any number of other semi-expensive refinements. (Here, perhaps, it is worth noting that Virginia Woolf, in her famous essay on the subject of women and their subjugation, also notes that money is important, as well as space; she is, of course, absolutely correct.) Too many decisions! We kept researching, and all the while, the weeks crept on. And the manuscript went unrevised in its black, three-ring binder, bright pink and blue and yellow and green Post-It notes sticking out at me from between the pages like little tongues. Eventually, I went back to one of my earliest fancies: Roald Dahl's writing hut, a cozy little room in a day-shed. It possessed no stained glass windows, no view of the Downs, no complicated architecture to capture the natural light. It simply was a hut: a practical, small space made warm by the presence of the imagination and character of the artist who worked there. It was intimate. All the other spaces I had considered were huge by comparison: sheds and barns and free-standing structures with nooks and crannies and corners to turn. Why not simple, I thought. For the first time, I thought of the room just off our carport: a long, narrow space, full of unused junk from top to bottom, mostly leftover stuff from eight years past when Crystal and I were married. The room was frigid in the winter, sure, but it was small enough for a heater, and it had a ready supply of electricity. In the summers, it was naturally cool, like a cellar. And it was dry. It had walls made by people who (mostly) knew how to make walls. Most importantly, any work it needed done was doable by me: someone who had never framed anything or run a wire anywhere, who knew nothing about foundations or frost-lines or any of a hundred other potential structural hazards that precluded his building a freestanding structure that could withstand the elements. This is what the room looked like in September, 2014. First, I cleaned it out: one box of holiday decorations, one tub of action figures, one hoe and rake and mattress pad and extension cord at a time. Chemicals and paints and bookshelves and bike helmets and potting dirt. Two Christmas trees. Spider webs and dead bugs. The homemade shelves the previous owners had erected were packed to the very edge, and once they were emptied, it was clear, in their emptiness, what ridiculous things they were. The first real structural change to the room was to tear them out. Emptied, the space was perfect. Bare, simple. The right and rear walls, the outer walls of the house, were solid brick. The left wall featured framing over brick and mortar, the mortar sloppy and careless, as if never intended to be seen. The room was strangely incomplete and whole, all at once, a room in want of a revision. I knew right away that I would leave the brickwork on the left wall partially exposed so that I could use the framework here and there for bookshelves, to emphasize that it was and would always be a place unfinished, a place always in the process of a draft, never quite complete. The ceiling of the room was made of cheap plywood, gaps here and there to the crawlspace above the carport. I didn't like those dark crevices, so I covered them over with pine boards. And then I taped off around the boards for painting. 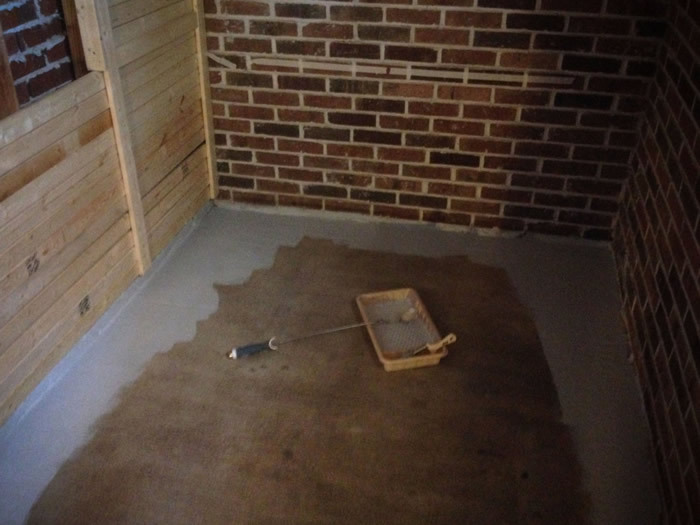 I scrubbed and cleaned the concrete floor, laid down a primer, then painted. Got the color wrong (too light). Painted again. Painted the ceiling a warm brick red. 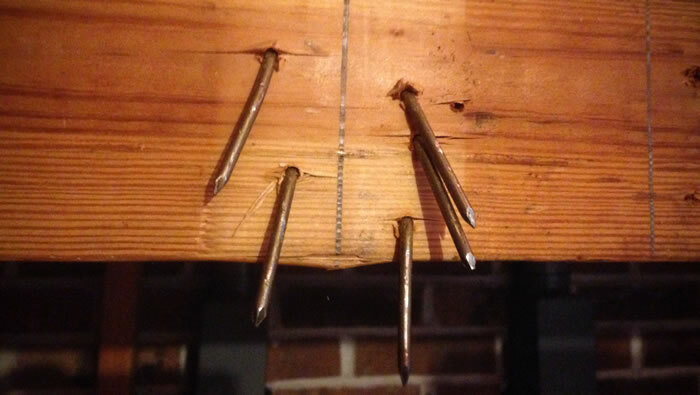 I sealed cracks with water-proof acrylic and discovered that my hatred for caulk and caulk guns knows no bounds. With the room prepped, Crystal and I arranged to have a new door professionally installed, my one real extravagance, as Georgia is, after all, a spidery place, and a good seal is a good investment. Next came the furnishings. We drove to IKEA in Atlanta, looking for a simple, inexpensive desk and some simple, inexpensive lighting (IKEA, for us as a couple, is a Nordic-themed wonderland where life is simplified to a kind of ice-flow essence without, somehow, sacrificing style; yes, Crystal and I do fantasize about getting small in a 632-square foot apartment). Not all the furniture was bought. I also included a bookshelf made by my grandfather, a shelf that's been with me since graduate school (this and a carpenter's pencil and a denim quilted shirt are all of his things that I own, and I used each of them throughout the course of this project). Soon, it was late November, and I had two hands with callouses, a solid knee injury from ascending and re-ascending a ladder more times than I ever will again for the rest of my life, and a genuine room of my own, in which I could then complete my revisions. After Thanksgiving, as the day-job allowed, and for one solid week of eight-hour days in December of 2014, I sat down at the desk above and I worked. I made the revisions in a room that smelled of pine furring strips and fresh paint. I added over 15,000 words to the manuscript, filling in holes and gaps in characters and narrative. In the end, those revisions got me an agent, though there would be even more changes to come, some minor, some major (I happily suspect there are always changes to come in this profession). But all of them since have been undertaken, religiously, in that room. I may not write every page of every book I ever write there, but each one will have some genesis or, at least, re-birth in this room, because it is, if nothing else, a space for working and reworking, the perfect nook for creativity. In a way, it's the cave of my own imagination, and somewhere in the darkness there, I know, I can always count on fire. I say all this to say: you'll hear a lot of conflicting things when it comes to whether you should set yourself to the task of writing or first preparing a space to write. Stephen King famously tells a story about wanting a big writer's desk and getting it and finding it worthless. By contrast, there's a picture of him in his office in the early 80s that I like very much, cocked back in his chair with his feet on his desk, a notepad on his lap, a dog under his chair. You can tell he's getting things done. The late great Barry Hannah said he did his best writing at the kitchen table, long-hand. Rowling, of course, wrote in a coffee shop. Some say spaces don't matter. Others, like Virginia Woolf, have said famous things on the subject that are usually quoted out of context by folks like me, urging the need for such a space. But Woolf had trouble concentrating in her own room, turns out -- the dog scratching at fleas, church bells ringing in the nearby village (one can't help wondering if the last thing she ever wrote in that place -- her goodbye letter to her husband -- was written in a state of distraction). Ultimately, the thing is this: where we write, like how we write, is up to us. Writing is, after all, a deeply personal, private act, encompassing the way we speak, the way we think, the way we view the world. Why should that process not include the necessity of a quiet, intimate corner of the world -- a shelter from howling winds or even howling cats? Know your own needs. And be honest with yourself. Sometimes procrastination is not so much a stalling tactic as a kind of unconscious creative patience at work: slow instinct, let's call it. Trusting your subconscious to know what you need and when you need it to support the work. Sometimes the deepest, richest parts of ourselves as writers -- those places we can only tap into at certain times, in certain chairs, in certain slants of light -- are guiding us, gently, toward the coziest, most productive place imaginable. At least, on a rainy night like the one pictured below, I like to think so, anyway. A doorway into my head.